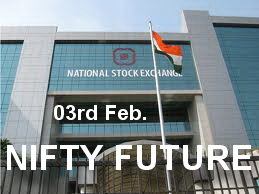 NF (5443) - Hurdle 5480-5500 and above that 5550 downside target 5396-5366﻿ and below that 5286. ﻿ FINANTECH (746) - As posted on 27th Jan. exactly it took support at 695 from there it already, yesterday, made a high of 758. so now as posted earlier, above 730 upside target of 775 and 900_930 are intact. TATACHEM (335) - Trade and close Below 330, ultimate down target 250. In between support exists at 312-308 & 285-280.